Looking for an automated online booking system for your business? 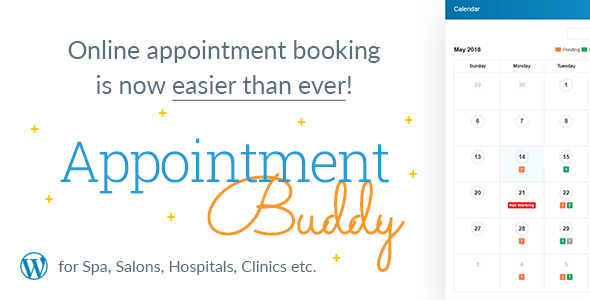 Appointment Buddy is the best choice with features like the unlimited staff, unlimited services, unlimited booking, unlimited notifications, online scheduling, Google Calendar sync. etc. You can control all your appointments at a single place. You don’t need to be professional, we made an easy online booking system for you. All you need to do is just configuration and you can set up your online appointment system within 10 minutes. This online appointment and scheduling also take care of your walk-in customers. Just configure it once and let your appointments managed by your buddy . Is this online booking plugin suits me? Yes, we love to help different businesses like salon, hospitals, gym, dentists etc. You will be amazed to see how easy you can configure different businesses like online dental appointment booking, online boutique and salon system. Appointment Buddy comes with multi currency support for both Paypal & Stripe. Multi Currency Support: Pay with currency of your choice. How to use “Appointment Buddy”?